James Issac Branaman was born in September 1862 at IA. He married Sarah E. Waychoff, daughter of Jackson Waychoff and Mary J. Hunt, on 13 June 1889 at Benton Co, IA.. He died in 1940 at Dixon Co, NE..
Wilbur A. Richardson was born in March 1857 at MI. He married Anna Rachel Waychoff, daughter of Jackson Waychoff and Mary J. Hunt, in 1884. Samuel B. Herl was born in 1859 at OH. He married Anna Rachel Waychoff, daughter of Jackson Waychoff and Mary J. Hunt, on 29 December 1911 at Linn Co, IA..
Ocie Waychoff was born in October 1887 at Greene Co, PA.. She was the daughter of Margaret Ann Waychoff. She married David Hotchkiss on 25 December 1905 at Steubenville, Jefferson Co, OH..8 She had no children. She died on 2 November 1969 at Burlington Co, NJ., at age 82. [S1130] 1900 Greene Co, PA. Census, South Franklin Twp. [S4597] 1920 Cumberland Co, NJ Census, Vineland. [S4473] 1910 Jefferson Co, OH. Census, Steubenville. [S4598] 1930 Burlington Co, NJ. Census, Chester Twp. [S4599] 1940 Burlington Co, NJ. Census, Moorestown. [S4600] Vineland, NJ. Directory ,1921. [S1088] Obituary ,Courrier Express, Camden NJ, 4 nov 1969. David Hotchkiss was born on 22 October 1877 at Moscow, Allegany Co, MD.. He married Ocie Waychoff, daughter of Margaret Ann Waychoff, on 25 December 1905 at Steubenville, Jefferson Co, OH..9 He lived in 1918 at West Middlesex, Mercer Co, PA.. He lived in 1942 at Moorestown, Burlington Co, NJ.. He died on 28 July 1962 at Moorestown, Burlington Co, NJ., at age 84. [S4600] Vineland, NJ. Directory ,1921, 1924. [S4601] The Philadelphia Inquirer ,30 jul 1962. 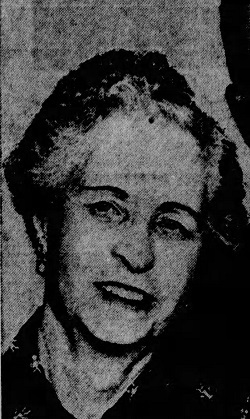 Carol Joann Conrad is the daughter of Kenneth Max Conrad and Helen F. Waychoff. Loretta Marie Baker is the daughter of John Robert Baker and Carol Joann Conrad. [S4603] Letter, Jeffrey Sassmannshausen to Howard Hickman, Sept 2007. Mary Anne Moser was born on 1 February 1942 at Detroit, MI.. She married Archie Melton on 26 July 1958 at Akron, OH.. She and Archie Melton were divorced on 29 April 1963 at Summit Co, OH.. She married Ronald Gene Jones, son of Harold Gale Jones and Bessie L. Hawk, on 15 May 1963 at Angola, Steuben Co, IN..1 She died on 7 February 1997 at age 55. Paul Morgan Watson was born in August 1909 at WV. He married Virginia Isabelle (Dare) Gawthrop, daughter of Ralph Allen Gawthrop and Zelma Mae Robinson, on 18 February 1935 at Pottsville, PA.. He died in February 1959 at age 49. [S4605] 1940 Barbour Co, WV. Census, Philippi. [S4609] Paula Eyerman, e-mail to Howard Hickman, June 2017. Paul Kessler Dorvitt was born on 21 February 1913 at Harrison Co, WV.. He married Vevia Willa Gawthrop, daughter of Ralph Allen Gawthrop and Zelma Mae Robinson, on 8 September 1939 at Winchester, VA.. He died in February 1981 at Harrison Co, WV..
Fergus McOsker was born on 8 November 1824 at Dublin Twp, Bedford Co, PA.. He married Mary Elizabeth Baxter, daughter of Moses Baxter and Sarah Hickman, on 7 December 1851 at DeKalb Co, IN.. He died on 7 September 1901 at Woods Co, OK., at age 76. Franklin Pierce "Frank" McOsker was born on 28 October 1852 at Waterloo, DeKalb Co, IN.. He was the son of Fergus McOsker and Mary Elizabeth Baxter. He died on 11 June 1941 at Turon, Reno Co, KS., at age 88.